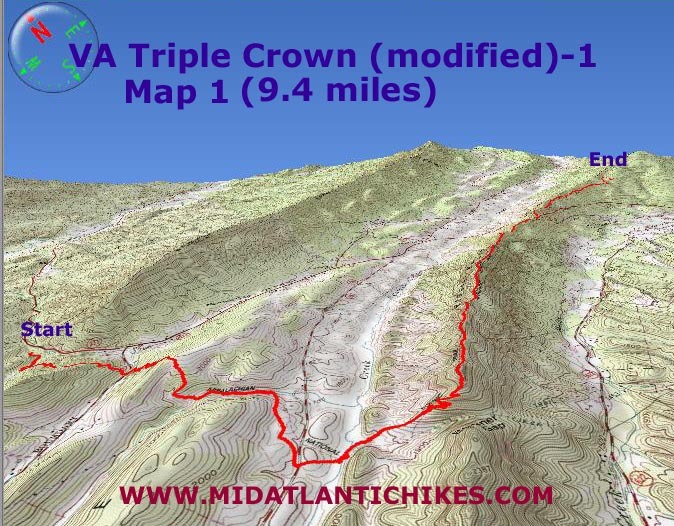 Description: The three best vistas on the VA portion of the AT are considered to be, from south to north, the Dragon’s Tooth, McAfee Knob and Tinker Cliffs. 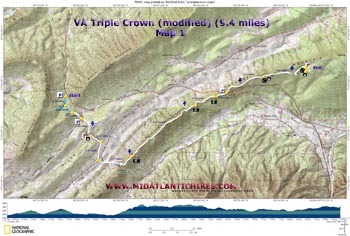 I previously day hiked to the Dragon’s Tooth in October/2009 so wanted to exclude it from this current hike. 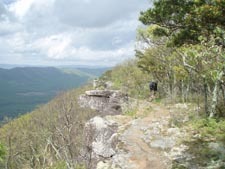 We replaced it with several views of Carvin Cove Reservoir on the northern end of Tinker Mountain and extended the trek to the intersection of I-81 and U.S. 220 instead of at the end of the Andy Lane Trail on Catawba Road. 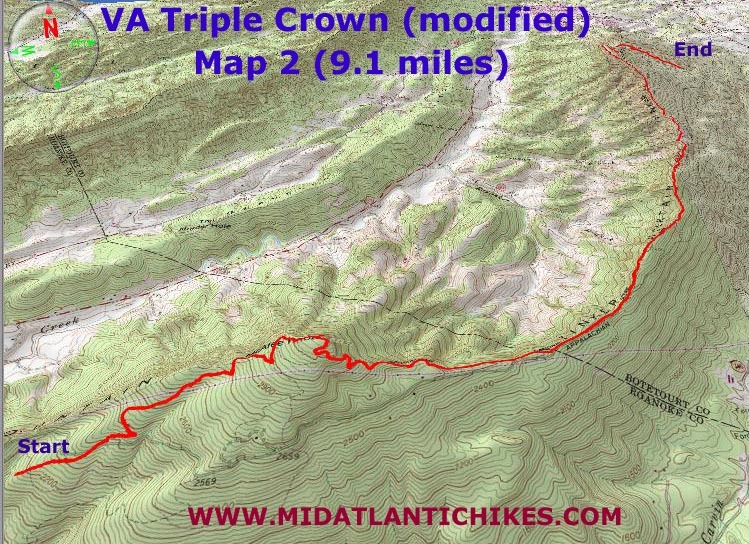 Since 99% of this hike is on the AT expect high quality, well maintained trails and some very nice switchbacks. On a clear day the vistas are “as advertised”. 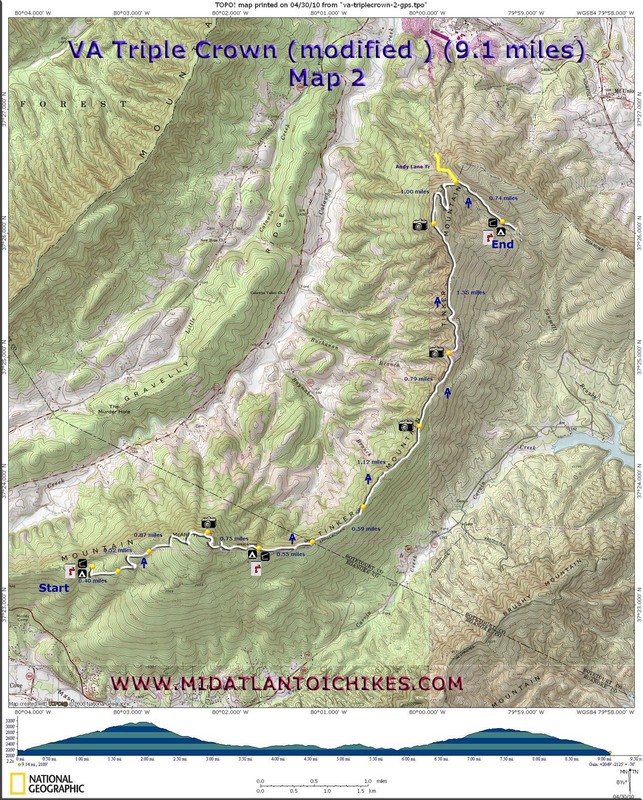 The total distance of this trek is approximately 28 miles with a total E.G. of around 5600 feet completed over three nearly equal days. Plant cars at Tinker Mountain Road (Rt 816) Park and Ride off of U.S. 220. The hike starts from the Dragon’s Tooth Trailhead on Rt. 311. The Park and Ride looks like this. Dragon's Tooth Trailhead looks like this. 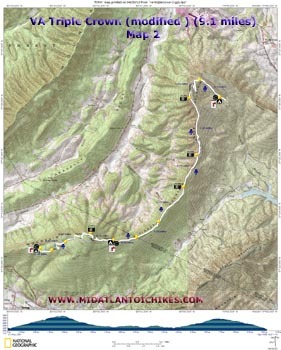 Trail Notes: The hike is described over three days. This can be changed but it also changes the camping and water logistics. Day 1, 9.4 miles, 2165 ft E.G. : From the parking lot follow the blue blazed Dragon’s Tooth Trail for only 0.28 miles before turning left onto the blue blazed Scout Trail. 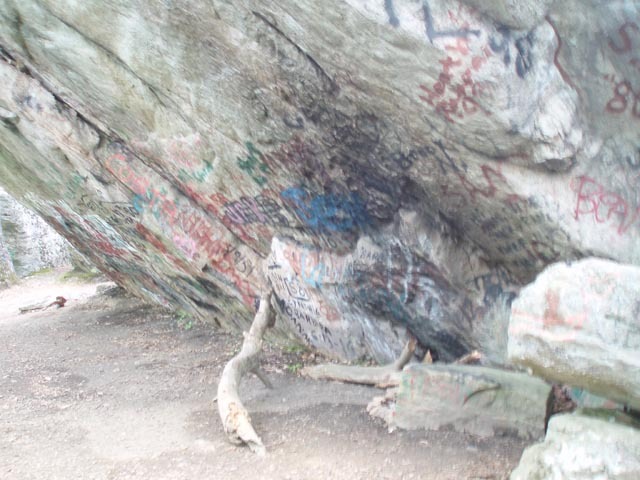 Campers from VT frequent this area. In 0.36 miles the AT will come in sharply from the right. Follow the white blazes. 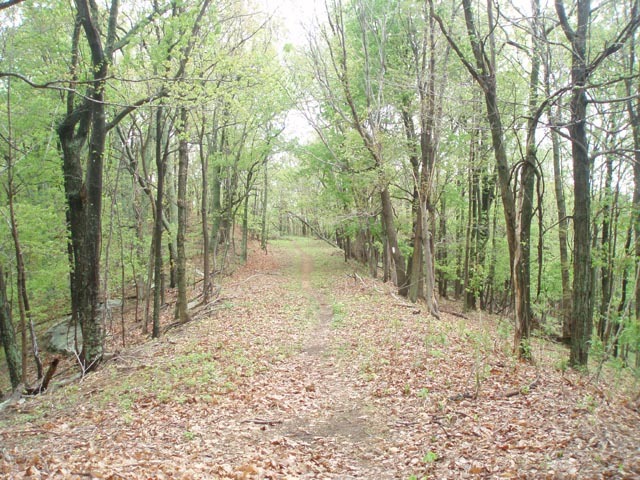 In 0.34 miles cross Route 624 and switchback up and over a low ridge. In 0.89 miles cross a stream on a bridge. There is a well used campsite in some evergreens to the left prior to the crossing. I do not know if this is a legal campsite. 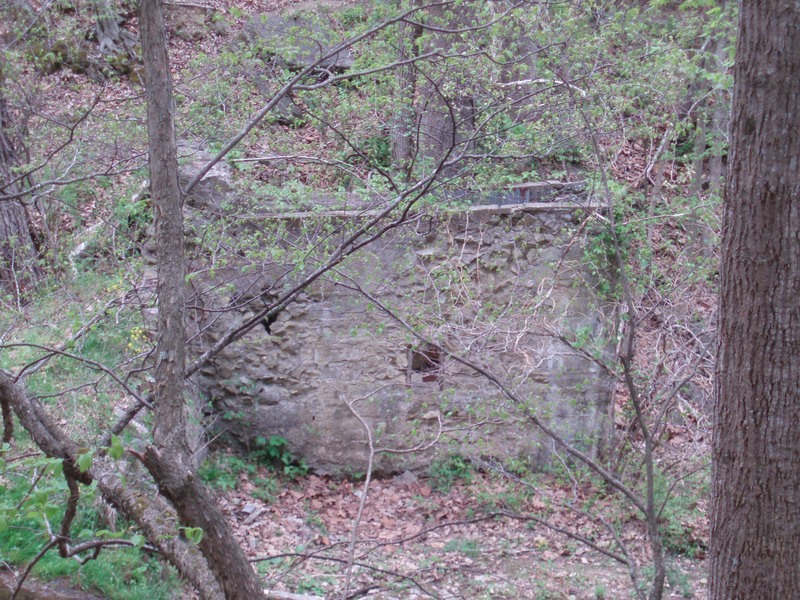 In another 0.32 miles pass the ruins of an old mill on the other side of the stream just before the trail enters picturesque pastures . 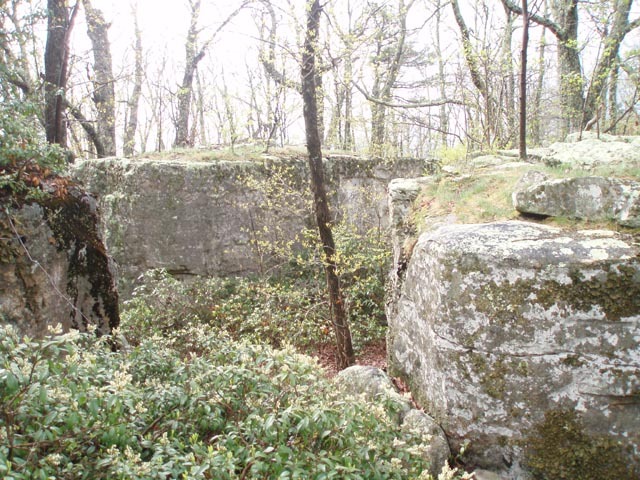 You will climb over 4 stiles as you navigate through them. In 0.47 miles cross Route 785 where you will pass through one more pasture. A stream is crossed by another bridge. 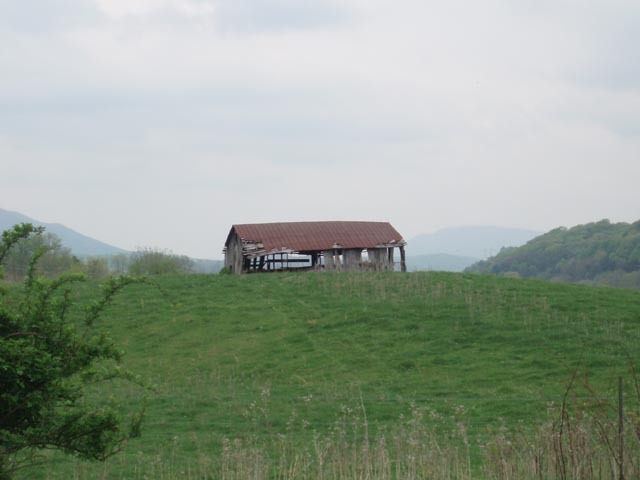 This is not shown as a water source due to its proximity to an “active” pasture. 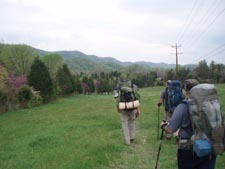 The AT soon leaves the banks of the stream and begins a steep climb towards Beckner Gap as it follows a power line. 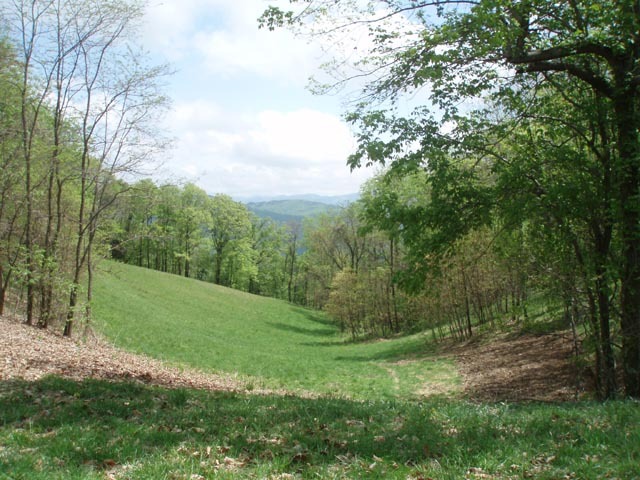 Instead of passing through the gap the trail veers to the left, reentering the woods, and switchbacks up to the initial ridge of Catawba Mountain. Your first view of Catawba Valley comes in 1.27 miles from the last road crossing with two more to follow, one in another 2.07 miles and then one more in an additional 0.53 miles. 0.39 miles after the last view cross Route 311 at a large parking lot. 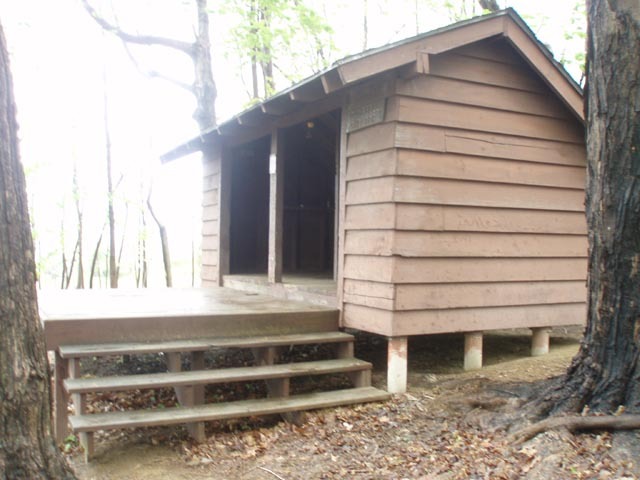 Pass waterless John’s Spring Shelter in 1.03 miles. 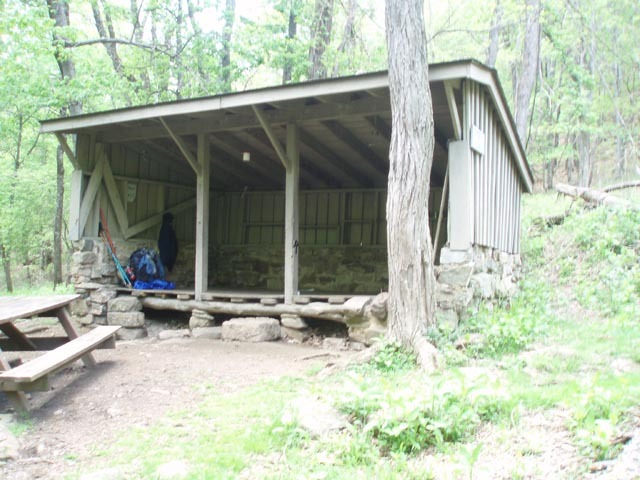 In another 1.31 miles arrive at Catawba Mountain Shelter. You passed a spring with a white pipe on the left just prior to the turn off. Tent sites are just a little further up the trail. This is you home for the night. Day 2, 9.1 miles, 2125 ft E.G. 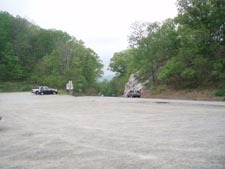 : The tendency today might be to break camp as fast as you can to get up to McAfee Knob but if it is foggy try to delay your departure to see if it burns off. When we visited it the view was totally socked in. An hour later we had very blue skies with some puffy clouds overhead. 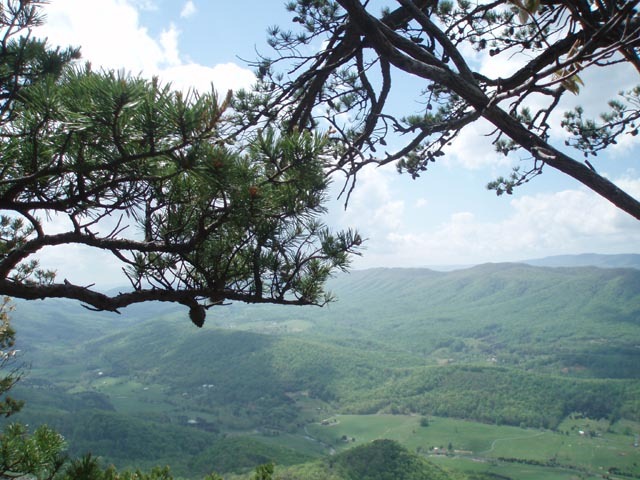 By that time we were 2 miles away from one of the best vistas in VA.
From camp continue NOBO on the AT. Cross a rocky service road (you’ll get to walk on some of it later in the day.) in 0.40 miles. In another 0.52 cross a power line swath. The trail then switchbacks for 0.87 until you are walking on a solid slab of rock. 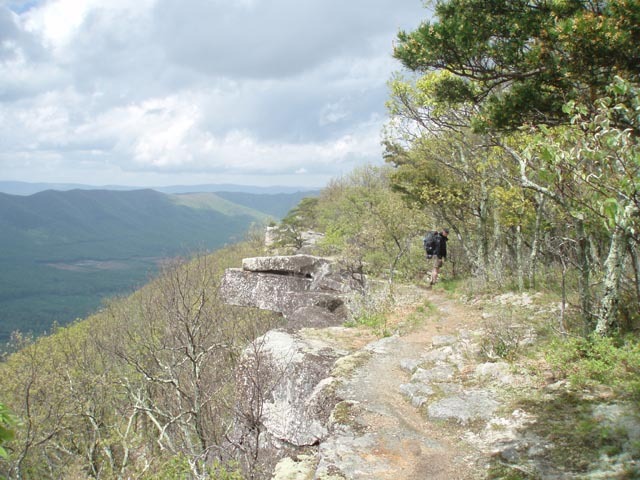 Turn left onto the short spur trail to visit the knob. The trail then descends through a massive rock maze before arriving at the Pig Field tent sites with spring spur on the right in another 0.75 miles. 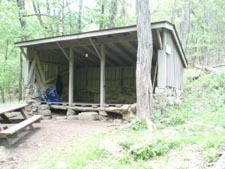 The Campbell Shelter is just another 100 yards up the AT. In 0.55 miles join the previously crossed service road that now comes in from the right. Keep a keen eye out for the blazes as you will leave it to the left in another 0.59 miles. Pass vistas in 1.12 and 0.79 more miles, respectively. 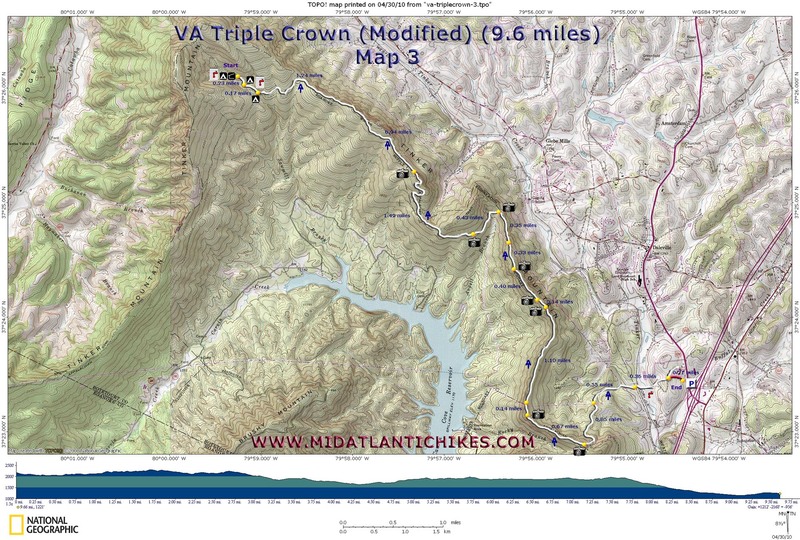 One will be towards Catawba valley and Great North Mountain to the west. The other will be an easterly view of Carvin Cove Reservoir and its drainage. (I honestly don’t remember which one is which!) 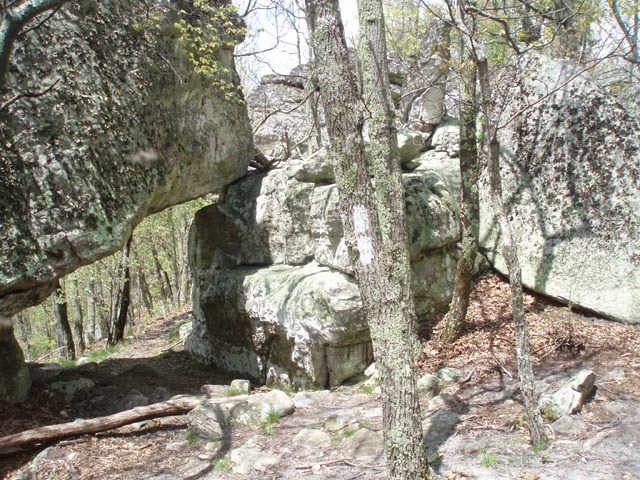 For the next 1.55 miles climb steadily through the rocks and in 1.55 miles arrive at Tinker Cliffs . Watch out as the AT makes a sharp right turn through some boulders as an un-named trail goes under a boulder straight ahead before petering out. 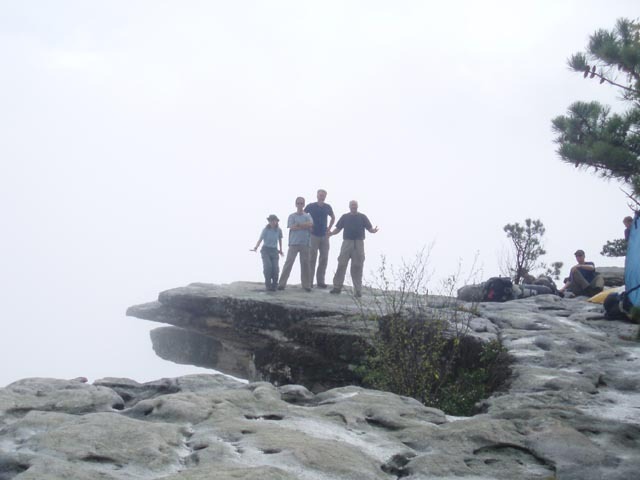 Once at the top enjoy probably the best view of the trek. 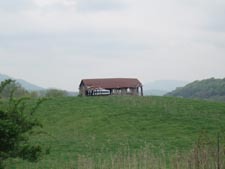 Not only can you see Catawba valley and the Great North Mountain (as well as other distant mountains) but you can look south and see nearly all of the ground you covered today including McAfee Knob. From the cliffs descend quickly to relatively flat Scorched Earth Gap and the junction with the yellow blazed Andy Lane Trail. (This would be the usual exit point of the trip if doing the original Triple Crown hike.) 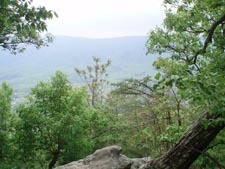 Scorched Earth Gap – The story is told that a trail maintenance crew had hiked up the Andy Lane Trail to do some work on the AT. 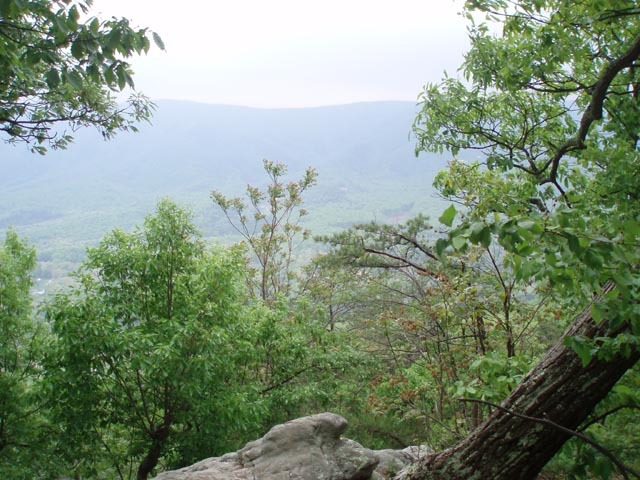 The trail climbs nearly 3000 feet in 3.1 miles. The leader claims that the language that came out of one lady’s mouth after the climb was so foul it … scorched the earth beneath them! From here follow the AT for another 0.74 miles to the Lambert’s Meadow Shelter , stream and tent sites. If it is too early in the day for you or the shelter area is crowded continue another 0.23 to 0.40 miles to some more descent camping areas. Day 3, 9.66 miles, 1212 feet E.G. 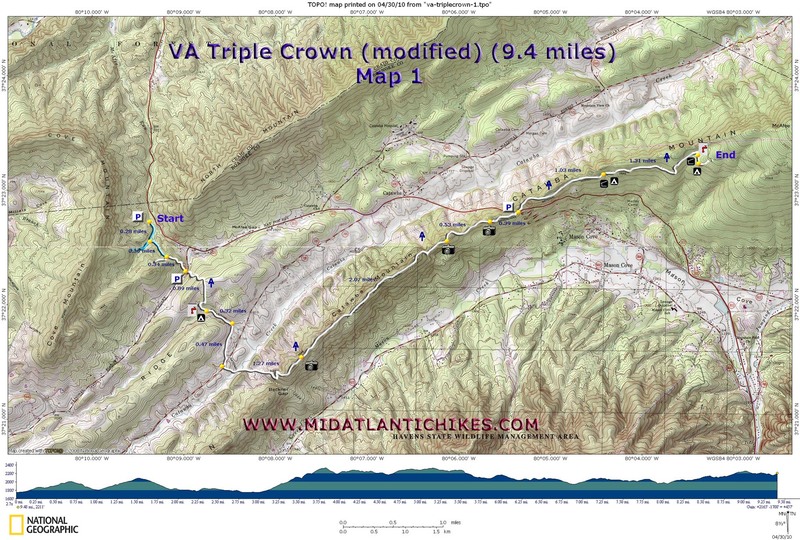 : The elevation profile looks pretty easy for today but there are several of these short, steep, rocky climbs as the AT fights to stay on the ridge top that seem to get buried in the data that eventually add up to a pretty good workout. Still it is not as hard as the previous days. After the Lambert Meadows shelter the trail descends to be near the stream for a while, passing the camping areas mentioned above. In between there is a bridge with a blue blaze. 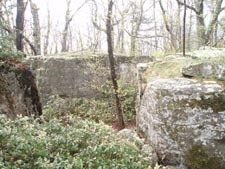 There is no sign here but I think it used to be what was once called the Tinker Cliff Loop Trail. 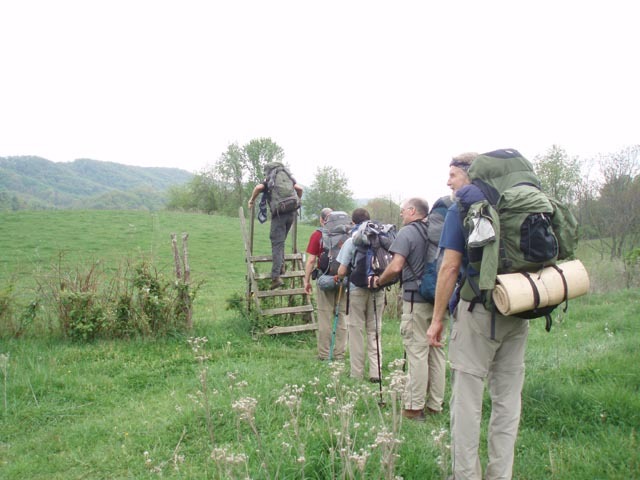 Continue on the AT and climb back toward the ridge, reaching it in 1.24 miles from the last campsite. You’ll pass a nice vista here. In another 0.94 miles pass yet another. The trail is re-routed off of the ridge for the next 1.49 miles before arriving at the next vista. In another 0.49 miles arrive at Hay Rock Overlook. This was supposed to be the highpoint of your day but vandals have ruined the majestic nature of this giant sandstone outcrop with their spray paint. (Not to worry! There are other fine views of views of the Carvin Cove Reservoir to the west and Daleville to the east to enjoy. I still can’t see the purpose of it!) In 0.35 miles from Hay Rock cross the first of several power line swaths. Views and power lines will alternate over the next 2.8 miles of the trail before it turns north under some high voltage lines and quickly descends over the next 1.40 miles, crossing under yet more power lines along the way. 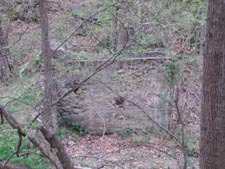 In quick succession cross a gas line swath, RR track and Tinker run (large culvert). 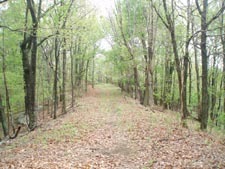 The trail veers to the right through a short relocation through a pine grove before reaching a split in the trail in 0.36 miles from the run. The AT goes straight. You want to bear right onto an abandoned road that soon leads you to the Tinker Mountain Road Park and Ride and your plant vehicle(s).